A baby root canal is the most commonly needed nerve treatment for a baby tooth. This treatment is necessary when a cavity in a primary tooth is deep enough to have affected part of the nerve. During a baby root canal, the affected part of the nerve is removed and a medicament is placed over the remaining surface. The purpose of a baby root canal is to maintain the integrity and health of a baby tooth and the supporting gum tissue and bone. It is an important part of preventing infection and maintaining the health of the developing adult teeth. After a primary tooth has had a baby root canal, the most effective and long lasting restoration is a crown. Crowns are a very durable restoration used to improve a tooth's shape or to strengthen a tooth. Crowns are most often used for teeth that are broken, worn, or have portions destroyed by tooth decay. Crowns are "caps" cemented onto an existing tooth. The crown fully covers the portion of the tooth above the gum line. The crown becomes the tooth's new outer surface. 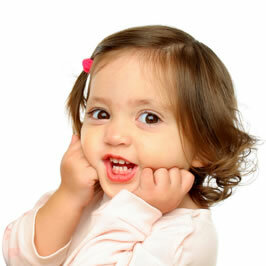 Crowns most often recommended for baby teeth are made from stainless steel.